One Sentence: Remember, remember the fifth of November. If you are not a comic book nerd, and you saw the preview for this movie, you might be much like my girlfriend or myself when you first saw this preview. I had never heard of the graphic novel. I knew nothing of this story, all I saw was a weird guy, in a mask, throwing knives. If you are like me, you would have thought to maybe even completely skip this movie, or perhaps are thinking that you could wait to rent it. I would say that you should not wait until it comes out on DVD. I would think almost anyone that is reading this would want to see it. Sometimes fiction might become a reality, can it be that one day, we watch a movie, or read a graphic novel, and we laugh, or think to ourselves, this can't happen. We read however, and are pulled into the story, and when it is over, we look out at our world, and smile and know it isn't like that. Or it used to not be like that, but now, you aren't too sure. The Matrix brothers, have spun another winner, with V. A look at a world of the future, that some would say, is looking a lot like our's today, in Bush's America. A tale of a corrupt government, that sounds very similar to changes that are happening today right here. We are protecting you. It is for your own good. You need us to keep you safe. The story alone is enough to keep you pulled into the story completely. However on top of this amazing tale, you have Natalie, which is truly amazing and strong throughout. Along with the masked V, they play the story out in a truly exceptional manner that makes you believe in this world and the pain that it is causing on them. The rest of the cast rounding out the police, and the corrupt government, keep the story believable in every way. I say story, but when we left the theater, we didn't feel like it was a story, but more of a picture of a skewed reality that we are seeing come this way. That if things keep going the way they are going we will be kept in our homes at night, that we will not have the choices we have now, and that it is all in the name of safety. Protection. For our own good. Whatever side of the coin you fall on, I think that you will enjoy the movie. A wonderful movie, and my first 5 star of 2006. 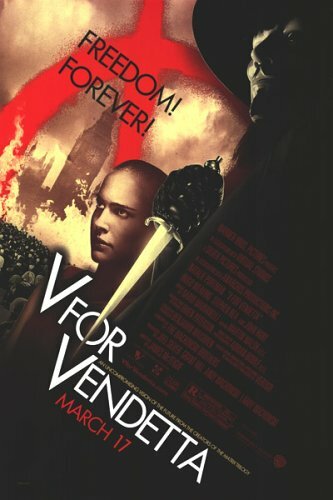 V for Vendetta. i loved v it was a well written movie, weaving was also excellent. infact i m going to watch this again right now.